Trevor Steel Trailers design and manufacture a wide range of leisure trailers for those interested in anything from Canoing to Mountain Biking. For example if you are a member of a cycle club it can often be troublesome and also costly for everybody to take their bike to your departure point on an event on the back of their individual cars. TS Trailers has the solution. 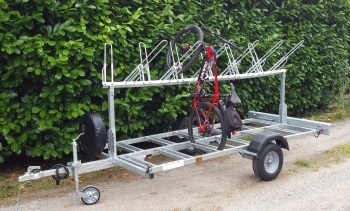 Mountain bike trailers which can carry up to 20 bike behind a single car. Car sharing then becomes a viable alternative and your weekend out in the hills doesn't hurt your pocket quite as much.